Gateway Canyons Resort & Spa in Colorado has opened the doors to Palisade Ranch. Sure, summer vacations by the beach are all the rage, but mountain resorts across the U.S. are packing the no-snow months with a frenzy of activity. We’ve got a snapshot of places to go and things to do for clients who want to reach for the sky. The Centennial State is home to some of the most gorgeous landscapes in North America—from the red rock formations to rolling grasslands, and, of course, those famous Rocky Mountain peaks. It’s made for clients who want to play in the great outdoors, and Vail Resorts, which runs Colorado’s Vail Mountain Resort, located on the White River National Forest, is inviting guests to “soar like an eagle, and see the world through the eyes of a trout” via its new Epic Discovery adventure launching next month (it will also be available at Vail Resorts’ Heavenly Resort in South Lake Tahoe this summer; and at Breckenridge in 2017). The program will feature on-mountain components such as ziplines, canopy tours, alpine coasters, wildlife trail exploration, and interactive, “learn-through-play” activities. Take the Game Creek Canopy Tour, which will immerse guests in the forest habitat with an array of ziplines and aerial bridges as high as 300 ft. above the valley floor, or the Forest Flyer, a gravity-based alpine coaster that allows guests on individual sleds to descend on a raised track through the forest while giving riders full control of their speed. While clients are “roughing” it outdoors, they can stay in the lap of luxury at the four-diamond The Arrabelle at Vail Square, A RockResort, located in the heart of Lionshead Village. It’s a cozy 81-accommodation property, including suites, with a 10,000-sq.-ft. RockResorts Spa, complimentary bikes during the summer, and pet-friendly accommodations, not to mention spectacular views of Vail Mountain. The property re-opens for the summer on June 24; if you book your clients by June 1, you’ll get them the best summer rates. Another spectacular Colorado setting can be found at the 72-room and -suite Gateway Canyons Resort & Spa, in the state’s red rock canyons near the border with Utah. This month, the resort debuts Palisade Ranch, calling it the “ultimate Western experience” as participants explore Western Colorado by horseback, drive cattle, learn to rope, and take historic tours of the surrounding area. The 1-, 3- or 5-day packages, available through Sept. 30, start at $1,399, and include daily meals, activity credits, ranch experiences, fireside cookout, resort transportation, use of resort bicycles, and a complimentary snack basket. It’s the year to pay homage to the National Parks, and clients headed to Asheville, one of North Carolina’s hippest cities, can opt for a package that celebrates the national parks’ important milestone this year, its centennial birthday. Asheville, which is in close proximity to the Blue Ridge Parkway, Great Smoky Mountains National Park, Chimney Rock State Park, and Mount Mitchell State Park, is the ideal jumping-off point for America’s Favorite Drive package. Available through November, the package includes accommodations at the historic Omni Grove Park Inn—did you know writer author F. Scott Fitzgerald wrote and slept there?—and a Parkway guidebook. While taking in all those picturesque surroundings, your clients will also be helping preserve it for future generations as a portion of the proceeds from the package help protect and preserve the famed scenic highway and park. Thrill-seekers will want to know, too, that North Carolina is home to what is considered America’s steepest, fastest zipline, the Gorge Zip Line Canopy Adventure in the Blue Ridge Mountains, located just off I-26 between Asheville and Spartanburg, South Carolina. The line is over a mile long and drops deep into the Green River Gorge, offering expansive views of the rigged chasm the river has cut over the eons and traversing 125 acres of verdant old growth forest. 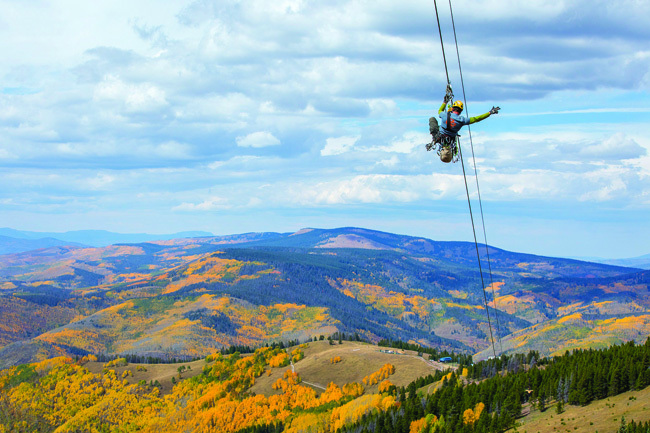 True adventurers can top off the zipline course with a “Quick Jump” at the end (gulp!). 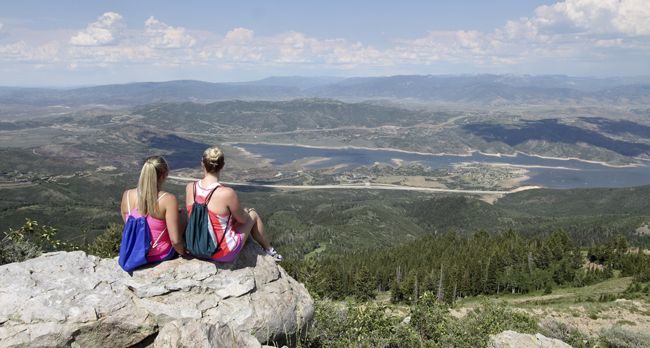 Nestled in Utah’s Wasatch Mountains, 36 miles east of Salt Lake City, in the historic mining town of Park City, Deer Valley Resort ups the ante for summertime fun with hiking, scenic chairlift rides, and lift-served mountain biking. In fact, mountain biking devotees will want to dive head first into all the action at Deer Valley as the resort is known for trails that are meticulously cared for and mapped for beginner to expert. The resort is investing in its existing mountain bike trail inventory, expanding on last year’s mountain biking enhancements by building a new beginner “flow” trail, Holy Roller; last year the resort built a new intermediate downhill mountain bike “flow” trail, Tidal Wave, adding berms, rollers and jumps. Five-star Stein Eriksen Lodge, located at 8,200 ft. at Deer Valley Resort’s Silver Lake Village in a prime mid-mountain location, is offering a World’s Best Mountain Biking package. Rates, which start at $345 in a deluxe guestroom, include daily mountain bike pass lift tickets for two to Deer Valley Resort; unlimited access to spa facilities and full access to resort fitness classes. Mountain biking is also at the top of the activities list at neighboring Park City Mountain Resort (Canyons and Park City are now operating as one resort, and fall under the Vail Resorts umbrella), but so is hiking. Here, hiking enthusiasts have an array of scenic treks to choose from, including the Red Pine Nature Trail and Lookout Ridge Trails, ideal for families or those looking for shorter hikes with great views; the Tombstone Trail, a moderate excursion for those seeking solitude; the strenuous Condor Trail; and the Fantasy Ridge Trail, for advanced trekkers looking to reach the highest peak at Canyons Village and challenge themselves by crossing the knife-edged Fantasy Ridge. An ideal home base for pre- and post-activity-filled days is the 124-guestroom and -suite Newpark Resort, A Destination Hotel, located minutes from the resorts of Park City at the edge of the scenic, 1,200-acre Swaner Nature Preserve. The property, which opened its doors this past November, is located right in the heart of the Newpark Town Center’s shops, galleries, restaurants and cafes, and clients who need ample space might want to opt for one of the 20 two-bedroom townhomes that come with gas fireplaces, heated bathroom floors and private decks with hot tubs. Call for rates. Solitude Mountain Resort, located on the Big Cottonwood Canyon of the Wasatch Mountains, 30 miles southeast of Salt Lake City, was purchased last year by Deer Valley Resort, which invested $7 million in improvements. The resort is offering a Mountain Adventure package, valid June 17-Oct. 2 at select Solitude Resort Lodging, including the 46-room Inn at Solitude, located in the heart of Solitude’s pedestrian village. Clients who stay two nights or longer receive 20 percent off their lodging, as well as two complimentary lift tickets for the Sunrise chairlift and 20 percent off a mountain bike rental or disc golf package.